John Doughty was born in New York City, on 25 July 1754 and he graduated from King’s College (later Columbia University) in 1770. He entered the military in 1776 and became the adjutant general of two Morris County, New Jersey, battalions. By January 1777, he had become a captain in the 2d Continental Artillery. 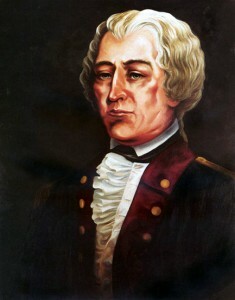 Doughty fought in the Revolutionary War battles of Brandywine, Germantown, Monmouth, Springfield, and Yorktown. In June 1783, he was transferred to the Corps of Artillery and rose to brevet major. When the Army discharged all the soldiers except 80 in June 1784, he became the ranking officer. He served as the ranking officer from 20 June to 12 August 1784. He retired from the Army in March 1791. Returning to active duty as a brigadier general in 1793, he served in the 2d Division of the New Jersey militia. Later, he retired and then returned once more to active service. In June 1798, he became a lieutenant colonel in the 2d Regiment of Artillerists and Engineers. He served until 1800, and then retired to his estate at Morristown, New Jersey. He died there on 16 September 1826.